Celebrating its centennial in 2017, the Clark County Historical Museum is dedicated to the collection, preservation, and interpretation of the cultural history of Clark County and the Pacific Northwest. 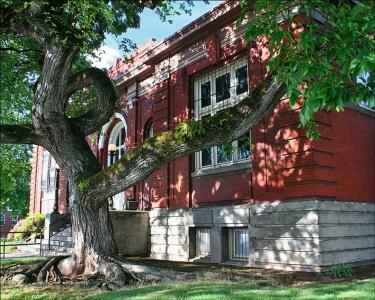 Located just off Main Street between Downtown and Uptown Village, the museum is operated by the Clark County Historical Society (founded in 1917) and housed in Vancouver’s 1909 Carnegie Library building. The building is listed on the National Register of Historic Places and received a recent overhaul including new flooring, fresh paint, exterior improvements, and enhanced meeting space. In addition to intriguing exhibits, featured programming brings life to the history. The Family Saturday program invites families to the museum to participate in fun, hands-on activities the second Saturday of each month. The most popular events are the summer downtown walking tours, with rotating content ranging from architecture and garden explorations. In October, the tours take a spooky turn with haunted walking tours. Also reoccurring on a regular basis, History Town Halls with moderated panel discussions bring together community historians and citizens to share stories of the past and examine the community’s place in Clark County history.